Cable Griffith is an artist, curator, and educator living and working in Seattle, WA. Griffith has exhibited nationally and internationally, including G. Gibson Gallery, the Frye Art Museum, Bellevue Arts Museum, the Whatcom Museum, and Aqua Art Fair (Miami), and the NEoN Digital Arts Festival in Dundee, Scotland. He has received numerous awards and commissions, including a large installation at Seattle-Tacoma International Airport. Griffith’s work is in multiple collections, including Microsoft, Vulcan, Weyerhaeuser, Capitol One, and the Washington State Art Collection. 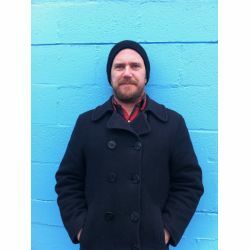 Curatorially, he served as Kirkland Arts Center’s Exhibitions Director from 2007-2010 and as Exhibitions Curator at Cornish College of the Arts from 2010-2014. Griffith received a BFA from Boston University and an MFA from the University of Washington. He is a professor at Cornish College of the Arts.